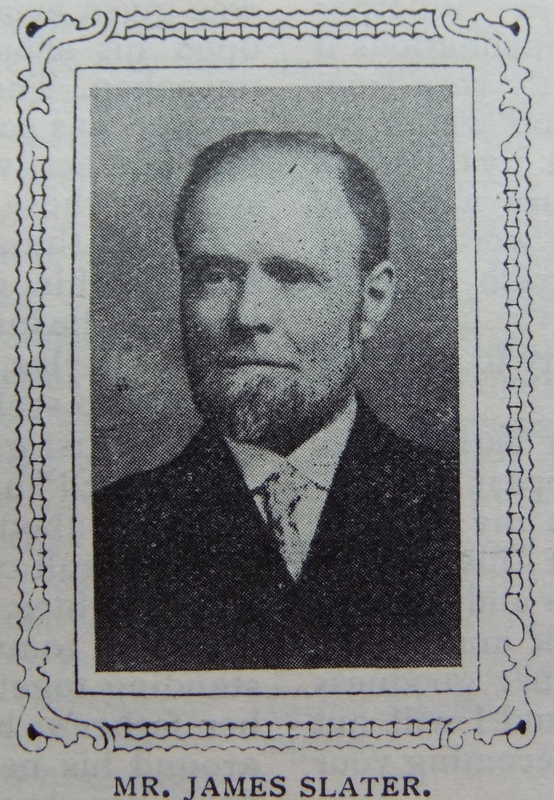 “I owe everything to Primitive Methodism.” That is the concise and frank acknowledgement of Mr. James Slater, our esteemed Society Steward at Barrowford for nearly twenty years. He has sought to repay this debt of gratitude by long years of devoted, efficient and acceptable service until it may be difficult to tell, on which side now lies the balance. Mr. Slater was born at Newchurch on the shoulder of Pendle. He never knew the loving care of godly parents, but as a boy he strolled one Sunday into our Barley Chapel. The minister, Rev. D.T. Maylott, the message, the text he remembers to this day. These impressions were deepened by his godly Sunday School teachers. He grew up is association with the little community, and when a young man during revival services conducted by the Circuit Minister, Rev. T. Markwell, he stepped out boldly for Christ and joined the church. Mr. Slater is a man of considerable resource, tenacious in purpose, patient and genial. He was sent to the mill to be a weaver but so utilized his spare moments as to make himself a capable engineer. His work necessitated his removal from the chapel of over two miles, yet he was scarcely ever absent. In Barrowford he has witnessed great advancement of our church of which he is leader, teacher, trustee and school superintendent. At the week-night service, prayer meeting, open-air and business meetings you may always expect James Slater. Wider interests have had his attention. He was a member of the School Board and is the leader of the local Co-operative movement. More than once he has attended the District Synod for his Circuit, and sat as a delegate in the Leicester Conference of 1907. At nigh three score years, Mr. Slater is still vigorous, and we pray that he may be long spared. James was born abt 1849 at Newchurch in Pendle, Lancashire. James worked tending stationary engines at a cotton weaving mill. James married Margaret (abt 1851-1934) circa 1870. Census returns identify six children. James died on 24 February 1927 at Barrowford, Lancashire.